The worldwide distribution of green sea turtles (Chelonia mydas) makes saving this endangered species from extinction ever more difficult. 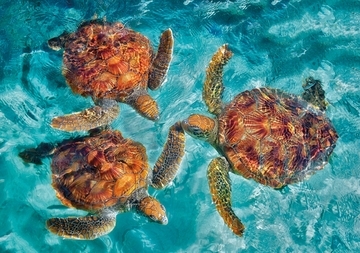 Green sea turtles are protected by various national laws and international treaties, and in some areas there is great effort to preserve their coastal habitats. In others, they are still threatened by poaching, illegal trade, and incidental capture from fishing equipment, among other risks.